When carrying out repairs, there is always a choice of finishing the ceiling. 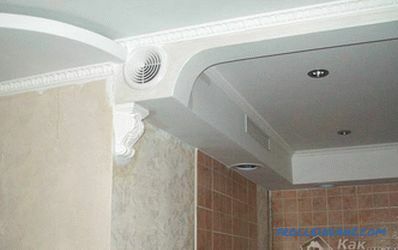 High requirements for the aesthetics of the room do not allow open pipes, ventilation and other communications. 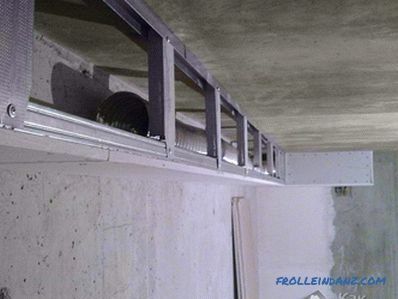 You can hide any wires and highways by installing a drywall box. 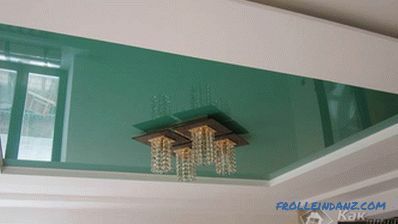 This design looks spectacular on the ceiling in any room: kitchen, hallway, living room, bedroom. The finished design looks like a two-level ceiling, but its installation will be cheaper. The shape of the box is selected in accordance with the overall interior of the room, spotlights will be its organic addition. In this article we will tell you how to make a drywall box on your own, consider various options, and also demonstrate photo and video instructions. 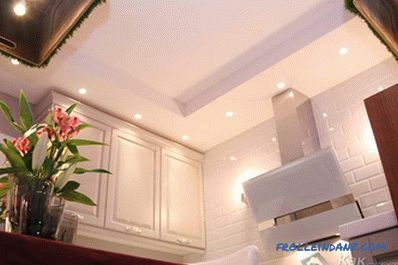 Drywall - safe and environmentally friendly material, its use is safe for health. 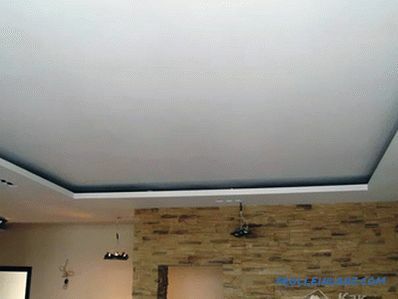 The design allows you to create any geometric shape and serves as an important element of the ceiling decoration. 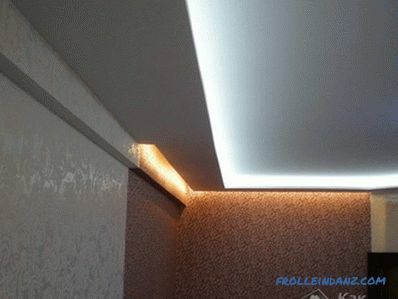 Ability to embed additional lighting. High degree of fire safety. 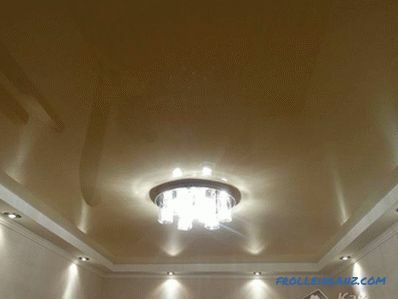 The drywall sheet represents is a building material, based on the hardened layer of gypsum with filler. 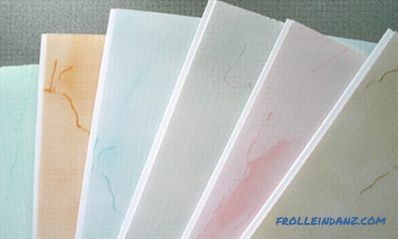 Both sides of the sheet are covered with paper, which serves to protect the inside and ensures the stretching of the material during operation. Versatile and inexpensive material is widespread. Depending on the purpose, it is divided into moisture resistant, material designed for normal humidity, and fire resistant. 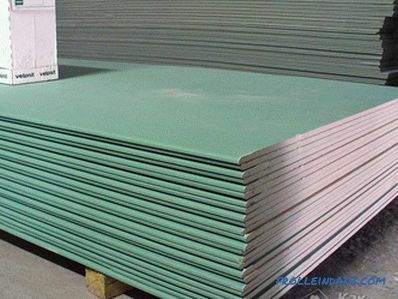 Cellulose-reinforced gypsum-fiber sheet has excellent strength characteristics. 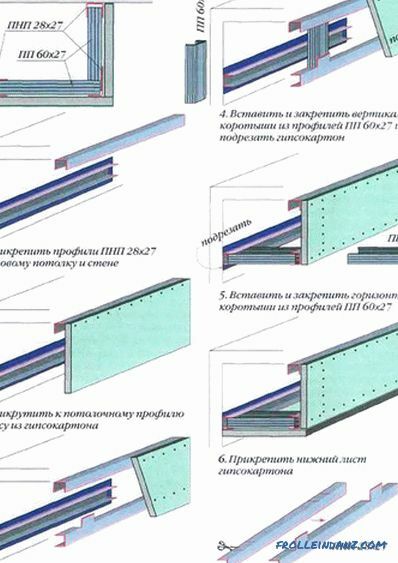 When choosing a material, it is necessary to pay attention to its quality: sheets of plasterboard should not be chipped, galvanized surface profiles should be uniform. The rigidity of the metal frame ensures the safety of the whole structure, it is better to purchase material from well-known manufacturers. 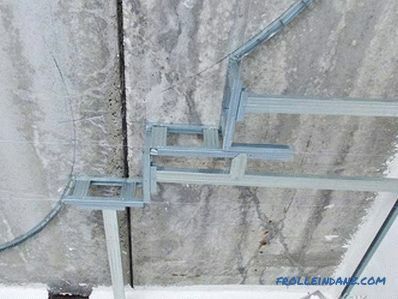 Fasteners and profiles must be of the same brand. Before installing the box, you must complete a drawing that will allow you to calculate the amount of material. Until sheeting, sheets are stored only in a horizontal position. 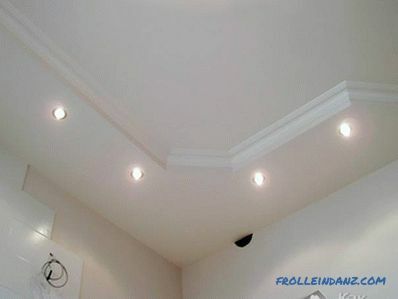 The ceiling, on which the plasterboard structure is installed, must be level, for this preparatory work is carried out. 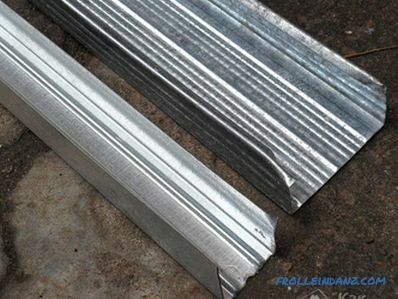 The reliability of the design is guaranteed only by an aluminum profile manufactured at the factory. 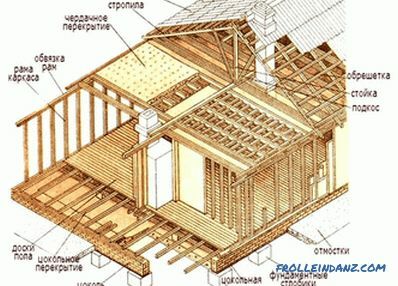 Only high-quality material can withstand the load and provides installation of a structure of any shape. 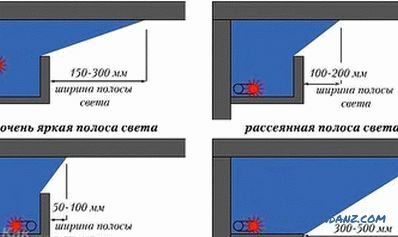 If the frame guides pass near hot pipes, then it is necessary to increase the distance between them, otherwise the heating will cause the metal to expand and damage the box shape. Before the beginning of the lining, marking is applied to the sheet. After fixing the sheets, the putty is applied and the surface of the structure is painted. Measuring devices: tape measure, plummet, level. 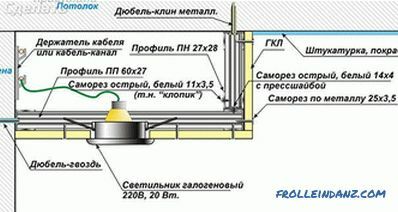 Before you assemble the box on the ceiling, it is necessary to conduct a markup. The lines are drawn with a pencil, the parallelism of the marking is controlled by a bubble or laser level. 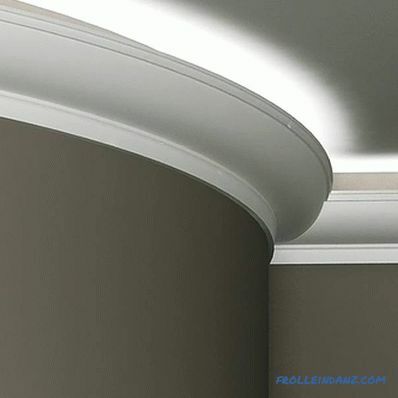 Lines for subsequent mounting guides are drawn on the walls and ceiling. Pipes that will hide the box, you need to properly primed and painted, after mounting the design they will be difficult to access. 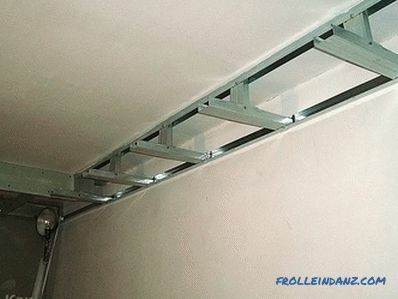 For convenience, you can expand the profiles for the frame on the floor and transfer the markings to the ceiling. Along the fastening lines, the holes for the dowels are made using a perforator. Guides that form the top of the box are attached to the ceiling. 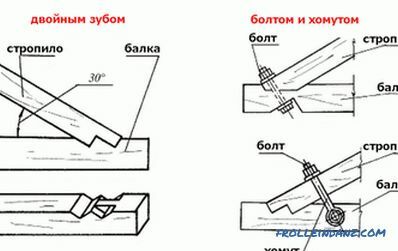 Suspensions for fasteners are made independently, the guide profile is cut into segments of the desired length. 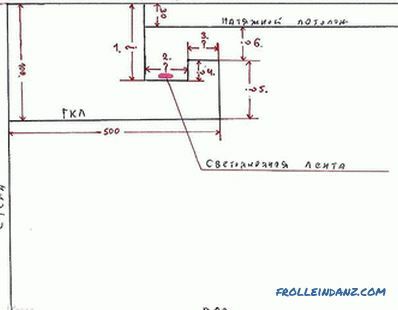 A guide UD profile is screwed around the perimeter. 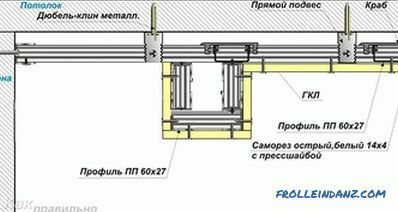 It forms the plane of the structure; the shape of the box depends on the accuracy of the horizontal level when it is fixed.Fixing galvanized strips occurs with screws. 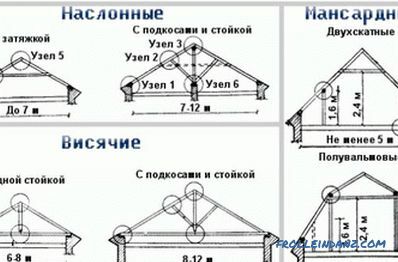 The mounting step should be from 30 to 60 cm, it depends on the weight of the structure. If there are holes in the starting profile, this will facilitate installation. 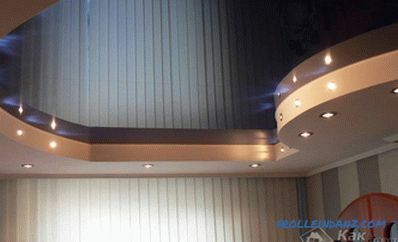 Suspensions are attached to the ceiling by marking. They are easily cut with scissors along the length of the box. A self-supporting CD profile is attached to their lower part with screws. The main load of the structure falls on this element, because the sheets of drywall are screwed to it. All parts must be in the same plane, any bends are not allowed. 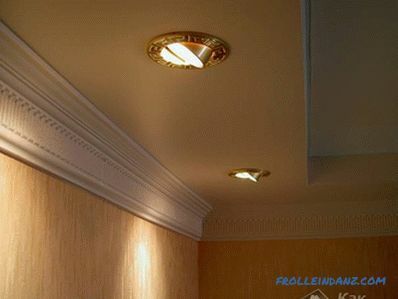 It is necessary to prepare the wiring for spotlights, marking out the places of their installation. The wires are fixed in order not to damage them upon further installation of the box. At last, the transverse parts are screwed, they are mounted perpendicular to the wall with a step of 60 cm. The frame is ready, you can sew it with sheets. Fits the cover until it is fixed insulation, if provided. 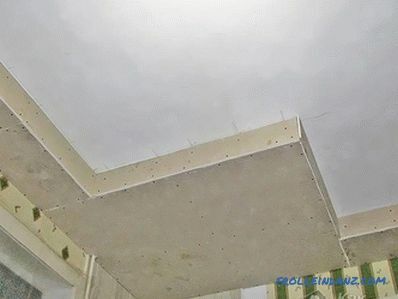 Sheets of drywall are cut to the size of the box. 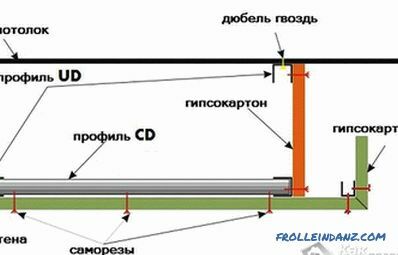 The joints of two adjacent sheets should be placed on the same CD-profile. Initially, the lower part of the structure is sewn, and then the side one. The material is fixed by self-tapping screws, the heads of which are recessed by 1-2 mm to facilitate the putty. Round holes are cut out in the places where luminaires are installed. 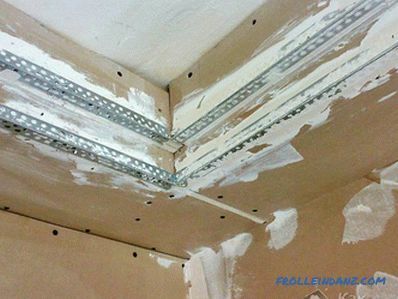 The finishing of the plasterboard box starts with a primer the entire surface. After drying comes the turn of the starting putty. Putting putty responsible and complex procedure, improper finishing spoil the overall impression of the appearance of the structure. For quality work, professional masters use two spatulas - working and auxiliary; it is worth considering their experience and making a wide and narrow spatula. 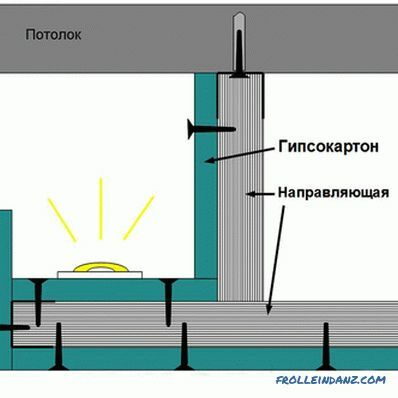 The auxiliary tool is applied a layer of putty, and the main leveling. The corners of the structure are decorated with a metal corner attached to the starting putty. It is necessary to press the element to ensure a snug fit to the box. After removing the corners, the connecting seams are glued with a grid and filled with putty. When the finish of the seams is dry, the entire surface of the duct will be puttyed. This procedure occurs more than once, each layer gradually removes all irregularities. The finishing layer is very thin. Another secret is the use of starting and finishing putty from one manufacturer, this guarantees the compatibility of materials. Dried putty requires grinding the surface. To do this, first use a large, and then fine sandpaper. The box is assembled in the same way as described above. But there are some details that should be considered. 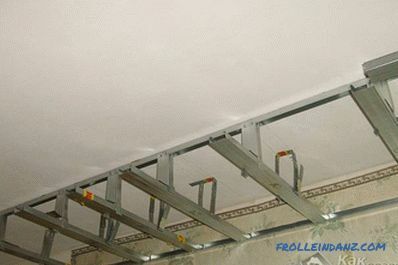 It is necessary to make racks-suspensions of the ceiling profile. 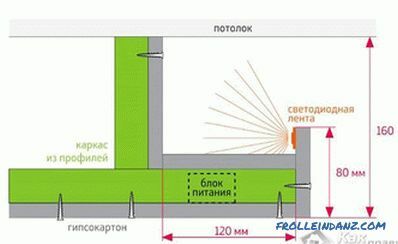 For this purpose, the profile should be cut, the size equal to the height of the box. On one side, make cuts along the folds, 40-50 mm high and fold the back wall inwards. The number of such blanks should be calculated so that they are installed every 60 cm along the length of the entire box. Insert the prepared stand-suspension into the guide profile on the ceiling with an uncut side and fasten it with a self-tapping screw. 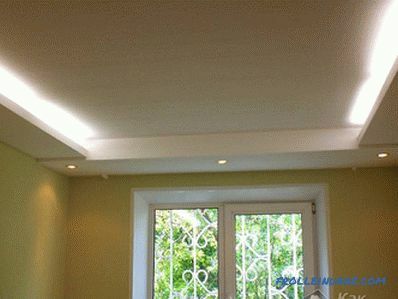 Now you need to make a blank of the ceiling profile. From it you cut the profile along the length equal to the bottom of the box. Consider the fact that the lower length will be different from the upper one, since there should be a shelf below to install the backlight. 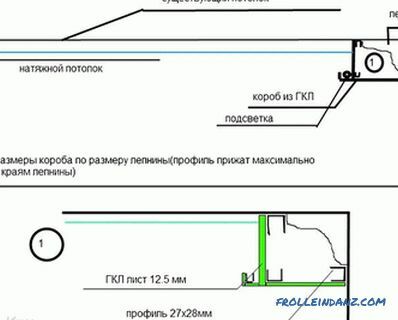 That is, the length of the section of the profile should be more than 5 cm from the length of the bottom of the box. This distance is quite enough to place the LED strip there. With one end, insert the blank into the guide profile on the wall with the shelves up and fix with screws. The other end is fastened with a rack-suspension. It is important to maintain an angle of 90 °. The result is a box with a protruding profile. Speakers should be silenced. To do this, paste on them cut pieces of the profile corresponding to the length. This will serve as the basis for mounting the drywall strip, and the LED strip will be mounted on top. Power supply unit with a capacity of 220 V for 12V LED strip. 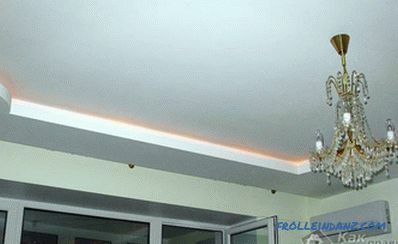 LED strip, which can be the same color or change color. It is not recommended to connect the ribbon to the power supply unit in series, since the next section of the ribbon will shine less. If the power of the unit is too large, then this greatly affects its size. Therefore, when arranging the frame, consider this. 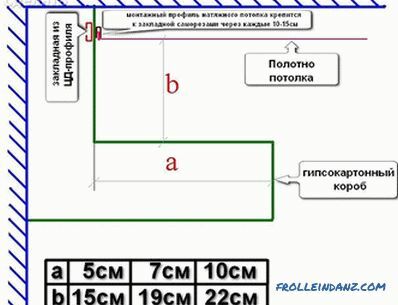 There is another option, for example, to purchase a power supply for each piece of tape, it has small dimensions. The tape must be glued to the shelf made. When everything is packed, you can connect it to the power supply. If we talk about the size of the box, it will depend on what you want to mask behind it. 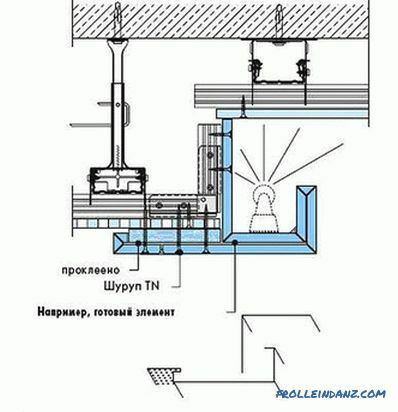 For example, it could be wiring, water pipes, gas pipes, the ventilation duct, and so on. If the backlight is installed, the size should be sufficient so that you can install the power supply and LED strip. A properly mounted box will decorate a room and will last for many years.